The WORCESTER PARK Blog :: Going, Going, Gone? It's certainly been going on a long time, but the possibility of 2-4 Green Lane becoming a place of worship is looking more likely to be gone come 30th March. It seems the old Bank Chambers is to be sold at auction at the end of the month, and that the owners who spent so much time and effort gaining planning permission for a place of worship there are, for whatever reason getting shot of the building instead. 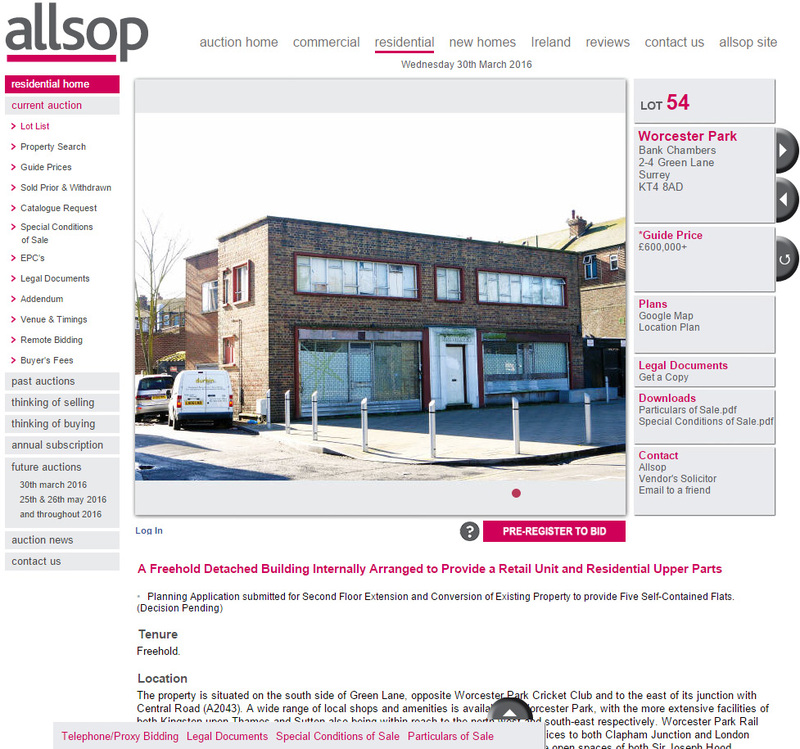 As reported here about a month ago, the owners of the building applied for planning permission to turn it into flats, having only just last year achieved planning permission for a place of worship on appeal despite a huge amount of local community objection to the traffic and parking it would bring. While there was some initial confusion over whether the new planning was being sought by the existing or a new owner, a number of people noted that the architectural drawings showed that the client was 'Golfrate Property Management Limited' and a few enquiries found that the director of Golfrate is one Mr Haroon Aziz. (Thanks to those who spotted this and let me know.) So it seems it was the same Mr H Aziz responsible for both applications. There was some concern raised at the recent WPRA meeting (which I chair) about the possibility of the Place of Worship permission becoming permanent after the four years temporary permission, and after the building had been extended, and it then being converted into an even larger place of worship. I am scheduled to have a meeting with councillors and council officers later this week to discuss this possibility, however the building being auctioned at the end of the month does make this possibility much more remote. This has not been the sort of saga where chickens can be counted before hatching and so, like I'm sure many others will be, I'll also be watching to see who buys it and what they plan to do there. For any potential buyers reading this, I understand this is most probably a business investment and you're not going to spend the money unless it looks like a good investment with a decent yield. If it looks likely to be of benefit to the local community, I will be happy to support it. If it looks likely to cause problems in what is already a badly affected area for traffic and parking, I won't.